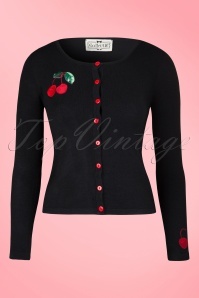 The vintage inspired 50s Jo cardigan Black Cherry by Collectif Clothing is just the thing to top off any fashionable number. Perfect for this season; not too warm, and not too light! A timeless black cardigan with round neck, long sleeves & button up closure. This sweet cardie features delicious cherry appliqués on either side of the buttons and looks just perfect with our dresses or teamed with jeans.